Fight weeds in an environmentally friendly way – even at lower temperatures! Long lasting, stops roots from growing. Visible results for weeds and grasses within 1 day after treatment. Complete herbicide effective against weeds including ground elder and horsetail. Supplied as a 510ml bottle, mix 85ml product with 500ml water for 5 sq m coverage. Weeds are annoying at the best of times, whether in newly cleared beds or established borders and this weed killer offers a solution that also works at lower temperatures. In contrast to most other weed killers, the effects of Superfast & Long Lasting Weedkiller do not depend on the metabolic processes that slowdown in cold temperatures, so even at temperatures of 5 - 10°C, effects may be seen from one day after treatment. 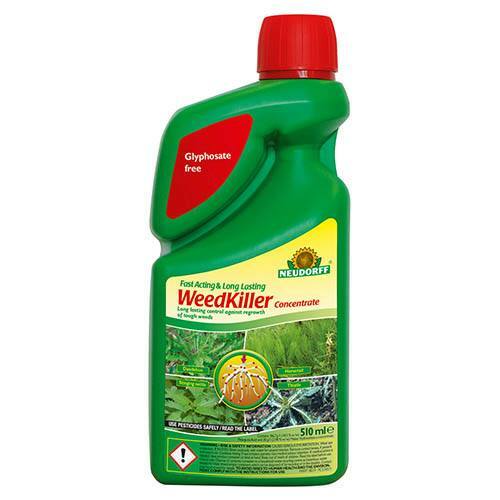 The biodegradable weedkiller is reliably effective against both annual and perennial weeds and tackles even stubborn plants such as field horsetail and ground elder. As it only acts on the green sections of a plant, but not on woody bark, it can easily be used also under hedges, trees and bushes. With a unique combination of pelargonic acid - a fatty acid that occurs in geraniums - and a growth inhibitor, it starts showing visible results quickly and also provides a long-lasting effect. The concentrate dilutes easily with water to give excellent ground coverage and once the spray has dried, pets can be released onto treated areas without concern. Supplied as a 510ml bottle, mix 85ml product with 500ml water for 5sq m coverage. The Pelargonic acid penetrates the waxy layer of the leaf and destroys the outer cell walls. This causes the top layer of cells to release moisture, so that the treated parts dry out quickly. Even before the leaves are destroyed the second ingredient, the growth regulator, penetrates the leaves and travels to the root tip – giving long lasting protection against regrowth. Spray very thoroughly and ensure the plant is dripping wet as only the parts of the plant which are coated will die. During treatment the leaves should be dry, otherwise the product will not be absorbed. The best result is achieved when weeds are in the growing stage and no larger than 10cm. In the case of problem weeds such as horsetail and ground elder you must repeat the application after approximately 4 weeks.